Something rather special is happening here soon. On May 1st, not only am I hosting an enchanting writer, I already know that I’m presenting you with the conclusion to an incredible story. Helena Hann-Basquiat is the author of Memoirs of a Dilettante – and if you don’t know what a dilettante is, darlings, go to her delicious blog to find out. I love postcards. I hoard them. I also write them a lot. I’ve travelled heaps, so some lucky people have postcards from yours truly from all over the world. I write in tiny script and sometimes send multiple cards to the same person when I run out of room. Do you ever do something *you* love in the belief/hope that other people feel the same way? Receiving postcards is one of my favourite things, so I send them often. Postcards don’t just tell stories – they map out journeys… I’m so glad that I have a collection to dive into – snapshots of different people at different times and places, frozen in that moment. I hope you’ll enjoy your snapshot of Helena’s journey – and join me tracing back through the blogosphere to find the rest of the tale. As with many things you glimpse – a photograph, a blogpost, a face – you’re probably not seeing the whole story in a postcard. I’m always interested in what came before and what comes after. What really happened? What makes someone the picture they present to the world? History becomes what people choose to write down… Who really knows the truth? But, then, what’s life without a little mystery? 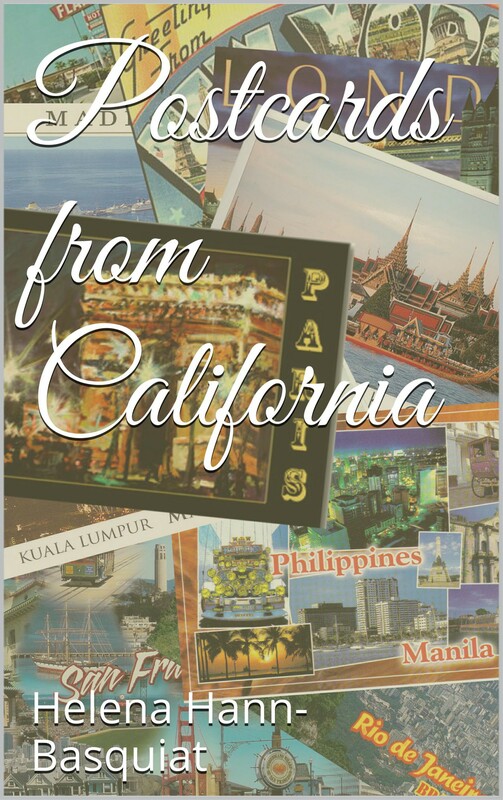 This entry was posted in On Reading and tagged California, editor, helena hann basquiat, make the right mark, memoirs of a dilettante, Postcards, Postcards From California, right ink on the wall, sara litchfield, writer on April 28, 2014 by Sara Litchfield. I write letters by hand, with a fountain pen. But generally only my over-80 friends reply by post instead of email. Ah after my own heart! I’m desperate to have a nice fountain pen again 🙂 I do have a few people who send me actual post – and I treasure them! I’m planning to buy a TWSBI Diamond Mini as a reward for finishing my WIP – whenever that may be!